The first Friday of a new month is quickly approaching which means that the US Bureau of Labor Statistics is preparing to release the nonfarm employment payrolls report – arguably the most influential employment statistic in the US for the preceding month. In this article, we will examine a binary option trading strategy that can be used to hedge your forex investments during the release of the nonfarm payrolls in order to increase your overall trading profits and reduce your exposure to risk. Since the nonfarm payrolls report typically measures the net change in job creation for about 80% of the US labor force, a higher than expected nonfarm payrolls reading could be a sign of strength for the US dollar since it would mean that more jobs than expected are being created in the US economy. On the other hand, a lower than expected reading could be a sign of weakness for the US dollar since it would mean that fewer nonfarm jobs are being created than expected. Given the strong impact the nonfarm payrolls often have on the value of the US dollar, many forex traders often anxiously await the release of the report in order to open a forex position based on the prediction for how the information will affect the dollar. Anticipation of a higher than normal payrolls number would warrant opening a short EUR/USD position, for example, since one would expect the US dollar to increase in value. A prediction of a lower than forecast payrolls number would warrant opening a long EUR/USD position with the belief that the US dollar would decrease in value vis-a-vis the euro. Let’s say you decide to open a forex position on EUR/USD at or around the time the nonfarm payrolls report is released but you want to cover yourself in case the EUR/USD performs contrary to how you expect it to. In this case, you may want to invest in an EUR/USD forex binary option that would yield a return in case the EUR/USD rate reacts contrary to you expectations. 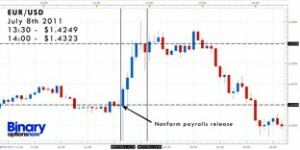 Scenario 1: Using the example above, let’s say you expected the nonfarm payrolls to come out higher than forecast so you went short on EUR/USD investing in one trading lot at 13:30 (GMT +1) when the pair is trading at 1.4250. At the same time, you invested $250 in a CALL on an EUR/USD binary option that pays out 85% and has a 30 minute expiry (14:00) in case the payroll numbers were lower than expected. The nonfarm payrolls reading came out much worse than forecast and so the US dollar began losing value rapidly. Since your forex position is losing money as the US dollar weakens, you close it 13:35 at around a rate of 1.4265. Your forex position lost .0015 (15 pips) for a net forex loss of $150. However, at 14:00 your EUR/USD binary option would have expired in-the-money since the EUR/USD rate was higher at 14:00 than it was at 13:30 when you locked in your investment. This leaves you with a profit of $212.50 (85% of $250 investment). Scenario 2: You believe the nonfarm payrolls will come out lower than forecast so you go long on EUR/USD at 1.4250 investing in one trading lot at or around the release of the nonfarm payrolls report at 13:30 (GMT +1). At the same time, You invest $250 in a PUT on an EUR/USD binary option with a payout of 85% that has an 30-minute expiry (14:00) in case the payroll numbers are higher than forecast. The nonfarm payrolls reading came out way below the forecast and the US dollar begins to weaken vis-a-vis the euro. You close your forex position at 14:00 at a rate of 1.4324 with a change of +.0074 (74 pips) leaving you with a profit of $740. At the expiry at 14:00, your binary option would have finished out-of-the-money since the rate of the EUR/USD is higher at 14:00 than it was at 13:30 so you receive the out-of-the-money payout of 15% of your $250 investment ($37.50) leaving with you a loss of $212.50. In both cases, you benefit from less exposure to risk since the binary option covers the possibility that the financial asset (EUR/USD) does not react as you predicted it would. And, more importantly, in both scenarios you end up with a profit. As you can see, using a binary option investment to hedge your forex position can help reduce your exposure to risk especially during the release of sensitive economic reports that are likely to seriously impact the financial markets. Keep in mind that past performance is not a guarantee of future results when it comes to financial investing. Financial markets may be impacted by a whole range of other factors beyond the release of information. However, in general using binary options can be a great way to hedge your other financial investments in case the asset in question does not perform as predicted. BinaryOptionsNow.com is the most comprehensive resource for binary options information and forex binary options broker reviews. As we can see, using a binary option investment to hedge your forex position can help reduce your exposure to risk especially during the release of sensitive economic reports that are likely to seriously impact the financial markets. Scenario 1 does NOT ensure a profit. It merely assumes that as the EURUSD is on its way down it will continue going down. Also, the price tends to whipsaw a lot when news like the nonfarm payroll comes out so you could get stopped out of your FX position and also end up losing on the binary option! In my experience using a guaranteed stop loss really is the only way to ensure a 15pip loss when high volatility news comes out. All in all, this is a S.H. !.T strategy! (not limiting it to this strategy) this is probably one of the best rules of trading. Binary options trading are giving some terms and conditions to explain trading stock at the exact target price. Time is the important concept to maintain in the trading. This reason makes traders has the flexibility over the market trading of stocks. Everything is possible in the online way of trading. Brokers makes the profit of the trading in the well knowledge way. By using binary options trading many people’s are getting more and more profit in a day. Hence you cannot able to make this much profit around the range of 70-80 percent of your initial come in anywhere. Once when you get experienced with binary options you won’t face any loss.